We were thrilled to write a guest spot for Living60010 about writing standout handwritten notes. Here’s the piece! You know that feeling of rifling through your pile of blah mail only to find an envelope hand addressed to you – by an actual human being. And, suddenly your mood perks up. “In our increasingly digital world, taking the time to write a note is a simple gesture that leaves a big impression,” says Melinda Hartz McElroy, Owner and Creative Director of billet-doux couture stationery and invitations. The value of a handcrafted card or thank you is appreciated more now than ever before, which is especially noteworthy with graduation and wedding seasons upon us. Whether thanking someone for thoughtfulness or offering congratulations, a heartfelt card communicates volumes in just a few words. The best part is that constructing one is as easy as 1, 2, 3. You have up to 48 hours to complete your mission of gratitude. The sooner you acknowledge their act of kindness, the more sincere your sentiments will be perceived. This applies to business, personal and social situations. Even if (way) too much time has passed you should always, always, always send a thank you card – this is truly one of life’s “better late than never” scenarios. Acknowledge your tardiness… and move on. No need to write a novel – be short, to the point but be sure to add a morsel of personalization by weaving in how their gesture has impacted you, or how you intend to enjoy their gift. Again, this thoughtfulness will add to the sincerity of your note. Three to four sentences should cut it. Close by wishing them well and note your anticipation of seeing them soon. Stock up on good etiquette essentials and increase your chances of being the considerate correspondent that you are. You’d be surprised the difference it makes to keep everything in the same work area, too. 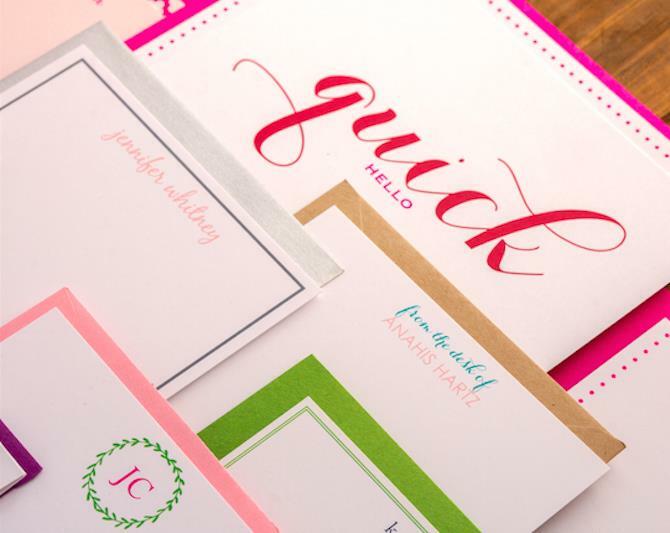 Personalized stationery: You can never have too much! I have clients who order different styles of personalized stationery for their varied moods or tone of voice. It’s amazing the difference that a slight change in font choice or envelope color can make. Favorite pen: Your quill of choice doesn’t need to be expensive, just so long as you like the way it writes and you can control your penmanship. Postage stamps: Select seasonal postage or a particular series that you really, really like. Even if you’re the only one who appreciates this stamp-sized subtlety, it’s another opportunity to leave your mark. Melinda (Hartz) McElroy, was raised in Barrington Hills and graduated from Barrington High School. She and her husband Michael moved back to Barrington in 2012 to raise their two sons. She is an active member of the Barrington Area Chamber of Commerce (BACC) and serves on the BACC Women’s BizNet board. Melinda started billet-doux in 2005 and has been spicing up mailboxes with one-of-a- kind wedding suites, invitations and stationery ever since. billet-doux’s offerings include wedding suites, social and business stationery, party and corporate event invitations, event details, baby announcements and holiday cards.